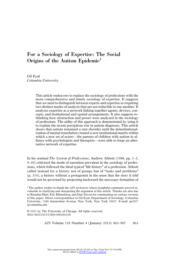 This article endeavors to replace the sociology of professions with the more comprehensive and timely sociology of expertise. It suggests that we need to distinguish between experts and expertise as requiring two distinct modes of analysis that are not reducible to one another. It analyzes expertise as a network linking together agents, devices, concepts, and institutional and spatial arrangements. It also suggests rethinking how abstraction and power were analyzed in the sociology of professions. The utility of this approach is demonstrated by using it to explain the recent precipitous rise in autism diagnoses. This article shows that autism remained a rare disorder until the deinstitutionalization of mental retardation created a new institutional matrix within which a new set of actors -- the parents of children with autism in alliance with psychologists and therapists -- were able to forge an alternative network of expertise.